Green is one of my favorite colors. It means hope and since I was a teen I’ve liked how it looks with my pale skin and hair. Today I’m showing you my latest shoot with talented photographer Núria Martínez. She is based in Manresa and we decided to shoot there. And here I am wearing the Lana dress from Lindy Bop in green. It was a Christmas gift from my love, and to be honest, it is one of the most versatile dresses I own. You can style it either with bamboo bangles for a more summer inspired look or with sparkly earrings and accessorize for a more glamorous look. Some photos were taken in front of Manresa’s old casino, which is now a public library. I love how the bright green of the dress looks with my ginger hair. 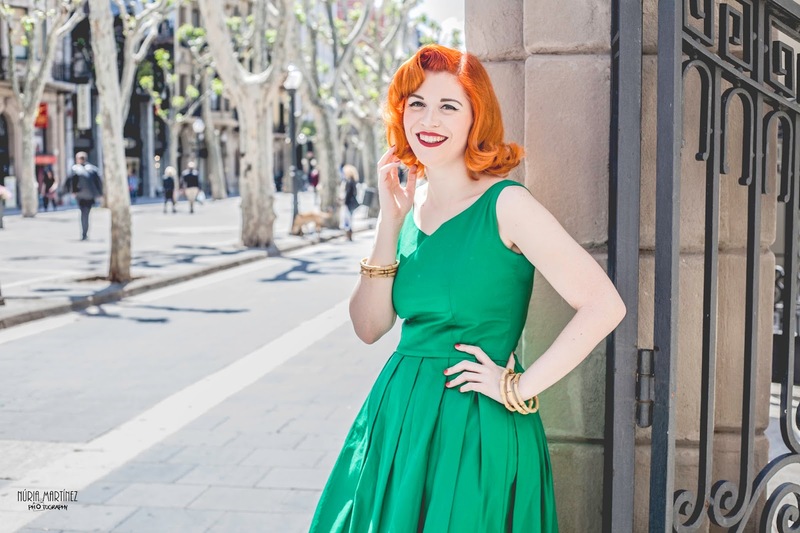 If you have red hair or ginger tones, don’t hesitate to wear green! It’s the perfect match. This dress is very comfortable and flatters every body type. If you are looking for a 1950s inspired swing dress, i’d recommend you the Lana from Lindy Bop. Wear it with a petticoat underneath and you’ll rock the 1950s style well! All photos by Núria Martínez.